Bro now uses the Broker Library to exchange information with other Bro processes. Broker itself uses CAF (C++ Actor Framework) internally for connecting nodes and exchanging arbitrary data over networks. Broker then introduces, on top of CAF, a topic-based publish/subscribe communication pattern using a data model that is compatible to Bro’s. Broker itself can be utilized outside the context of Bro, with Bro itself making use of only a few predefined Broker message formats that represent Bro events, log entries, etc. In summary, the Bro’s Broker framework provides basic facilities for connecting broker-enabled peers (e.g. Bro instances) to each other and exchanging messages (e.g. events and logs). With this comes changes in how clusters operate and, since Broker significantly differs from the previous communication framework, there are several changes in the set of scripts that Bro ships with that may break your own customizations. This document aims to describe the changes that have been made, making it easier to port your own scripts. It also gives examples of Broker and the new cluster framework that show off all the new features and capabilities. Review and use the points below as a guide to port your own scripts to the latest version of Bro, which uses the new cluster and Broker communication framework. The &synchronized and &persistent attributes are deprecated, consider using Data Stores instead. Usages of the old communications system features are all deprecated, however, they also do not work in the default Bro configuration unless you manually take action to set up the old communication system. To aid in porting, such usages will default to raising a fatal error unless you explicitly acknowledge that such usages of the old system are ok. Set the old_comm_usage_is_ok flag in this case. Instead of using e.g. Cluster::manager2worker_events (and all permutations for every node type), what you’d now use is either Broker::publish or Broker::auto_publish with either the topic associated with a specific node or class of nodes, like Cluster::node_topic or Cluster::worker_topic. Instead of using the send_id BIF, use Broker::publish_id. Use terminate instead of terminate_communication. The latter refers to the old communication system and no longer affects the new Broker-based system. For replacing remote_connection_established and remote_connection_closed, consider Broker::peer_added or Broker::peer_lost. There’s also Cluster::node_up and Cluster::node_down. Software::tracked is now partitioned among proxy nodes instead of synchronized in its entirety to all nodes. Known::known_hosts is renamed to Known::host_store and implemented via the new Broker data store interface. Known::known_services is renamed to Known::service_store and implemented via the new Broker data store interface. Known::certs is renamed to Known::cert_store and implemented via the new Broker data store interface. The cluster topology has changed. Proxy nodes no longer connect with each other. Each worker node connects to all proxies. All node types connect to all logger nodes and the manager node. Workers: are a good first choice for doing the brunt of any work you need done. They should be spending a lot of time performing the actual job of parsing/analyzing incoming data from packets, so you might choose to look at them as doing a “first pass” analysis and then deciding how the results should be shared with other nodes in the cluster. Proxies: serve as intermediaries for data storage and work/calculation offloading. Good for helping offload work or data in a scalable and distributed way. 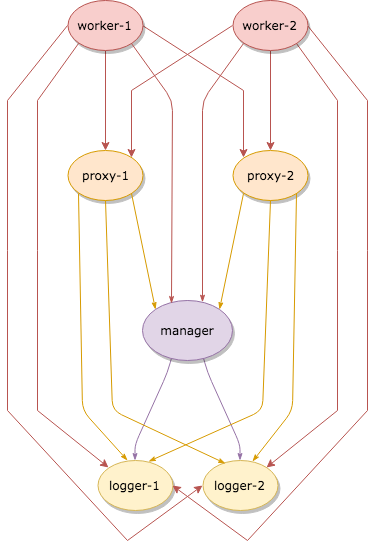 Since any given worker is connected to all proxies and can agree on an “arbitrary key -> proxy node” mapping (more on that later), you can partition work or data amongst them in a uniform manner. e.g. you might choose to use proxies as a method of sharing non-persistent state or as a “second pass” analysis for any work that you don’t want interfering with the workers’ capacity to keep up with capturing and parsing packets. Note that the default scripts that come with Bro don’t utilize proxies themselves, so if you are coming from a previous BroControl deployment, you may want to try reducing down to a single proxy node. If you come to have custom/community scripts that utilize proxies, that would be the time to start considering scaling up the number of proxies to meet demands. Manager: this node will be good at performing decisions that require a global view of things since it is in a centralized location, connected to everything. However, that also makes it easy to overload, so try to use it sparingly and only for tasks that must be done in a centralized or authoritative location. Optionally, for some deployments, the Manager can also serve as the sole Logger. Loggers: these nodes should simply be spending their time writing out logs to disk and not used for much else. In the default cluster configuration, logs get distributed among available loggers in a round-robin fashion, providing failover capability should any given logger temporarily go offline. There’s maybe no single, best approach or pattern to use when you need a Bro script to store or share long-term state and data. The two approaches that were previously used were either using the &synchronized attribute on tables/sets or by explicitly sending events to specific nodes on which you wanted data to be stored. The former is no longer possible, though there are several new possibilities that the new Broker/Cluster framework offer, namely distributed data store and data partitioning APIs. Broker provides a distributed key-value store interface with optional choice of using a persistent backend. For more detail, see this example. If you need the full data set locally in order to achieve low-latency queries using data store “clones” can provide that. If you need data that persists across restarts of Bro processes, then data stores can also provide that. If the data you want to store is complex (tables, sets, records) or you expect to read, modify, and store back, then data stores may not be able to provide simple, race-free methods of performing the pattern of logic that you want. If the data set you want to store is excessively large, that’s still problematic even for stores that use a persistent backend as they are implemented in a way that requires a full snapshot of the store’s contents to fit in memory (this limitation may change in the future). New data partitioning strategies are available using the API in base/frameworks/cluster/pools.zeek. Using that API, developers of custom Bro scripts can define a custom pool of nodes that best fits the needs of their script. One example strategy is to use Highest Random Weight (HRW) hashing to partition data tables amongst the pool of all proxy nodes. e.g. using Cluster::publish_hrw. This could allow clusters to be scaled more easily than the approach of “the entire data set gets synchronized to all nodes” as the solution to memory limitations becomes “just add another proxy node”. It may also take away some of the messaging load that used to be required to synchronize data sets across all nodes. The tradeoff of this approach, is that nodes that leave the pool (due to crashing, etc.) cause a temporary gap in the total data set until workers start hashing keys to a new proxy node that is still alive, causing data to now be located and updated there. If the developer of a script expects its workload to be particularly intensive, wants to ensure that their operations get exclusive access to nodes, or otherwise set constraints on the number of nodes within a pool utilized by their script, then the Cluster::PoolSpec structure will allow them to do that while still allowing users of that script to override the default suggestions made by the original developer. The broker framework provides basic facilities for connecting Bro instances to each other and exchanging messages, like events or logs. See base/frameworks/broker/main.zeek for an overview of the main Broker API. All Broker-based messaging involves two components: the information you want to send (e.g. an event w/ its arguments) along with an associated topic name string. The topic strings are used as a filtering mechanism: Broker uses a publish/subscribe communication pattern where peers advertise interest in topic prefixes and only receive messages which match one of their prefix subscriptions. Broker itself supports arbitrary topic strings, however Bro generally follows certain conventions in choosing these topics to help avoid conflicts and generally make them easier to remember. Note that the topics aren’t required to form a slash-delimited hierarchy, the subscription matching is purely a byte-per-byte prefix comparison. However, Bro scripts generally will follow a topic naming hierarchy and any given script will make the topic names it uses apparent via some redef’able constant in its export section. Generally topics that Bro scripts use will be along the lines of “bro/<namespace>/<specifics>” with “<namespace>” being the script’s module name (in all-undercase). For example, you might expect an imaginary “Pretend” framework to publish/subscribe using topic names like “bro/pretend/my_cool_event”. For scripts that use Broker as a means of cluster-aware analysis, it’s usually sufficient for them to make use of the topics declared by the cluster framework. For scripts that are meant to establish communication flows unrelated to Bro cluster, new topics are declared (examples being the NetControl and Control frameworks). For cluster operation, see base/frameworks/cluster/main.zeek for a list of topics that are useful for steering published events to the various node classes. E.g. you have the ability to broadcast to all nodes of a given class (e.g. just workers) or just send to a specific node within a class. The topic names that logs get published under are a bit nuanced. In the default cluster configuration, they are round-robin published to explicit topic names that identify a single logger. In standalone Bro processes, logs get published to the topic indicated by Broker::default_log_topic_prefix. For those writing their own scripts which need new topic names, a suggestion would be to avoid prefixing any new topics/prefixes with “bro/” as any changes in scripts shipping with Bro will use that prefix and it’s better to not risk unintended conflicts. Again, it’s often less confusing to just re-use existing topic names instead of introducing new topic names. The typical use case is writing a cluster-enabled script, which usually just needs to route events based upon node classes, and that already has usable topics in the cluster framework. Bro can accept incoming connections by calling Broker::listen. Bro can initiate outgoing connections by calling Broker::peer. In either case, connection status updates are monitored via the Broker::peer_added and Broker::peer_lost events. To receive remote events, you need to first subscribe to a “topic” to which the events are being sent. A topic is just a string chosen by the sender, and named in a way that helps organize events into various categories. See the topic naming conventions section for more on how topics work and are chosen. Use the Broker::subscribe function to subscribe to topics and define any event handlers for events that peers will send. There are two different ways to send events. The first is to call the Broker::publish function which you can supply directly with the event and its arguments or give it the return value of Broker::make_event in case you need to send the same event/args multiple times. When publishing events like this, local event handlers for the event are not called. The second option is to call the Broker::auto_publish function where you specify a particular event that will be automatically sent to peers whenever the event is called locally via the normal event invocation syntax. When auto-publishing events, local event handlers for the event are called in addition to sending the event to any subscribed peers. Note that the subscription model is prefix-based, meaning that if you subscribe to the “bro/events” topic prefix you would receive events that are published to topic names “bro/events/foo” and “bro/events/bar” but not “bro/misc”. To toggle remote logs, redef Log::enable_remote_logging. Use the Broker::subscribe function to advertise interest in logs written by peers. The topic names that Bro uses are determined by Broker::log_topic. Note that logging events are only raised locally on the node that performs the Log::write and not automatically published to peers. See base/frameworks/broker/store.zeek for an overview of the Broker data store API. There are two flavors of key-value data store interfaces: master and clone. A master data store can be cloned from remote peers which may then perform lightweight, local queries against the clone, which automatically stays synchronized with the master store. Clones cannot modify their content directly, instead they send modifications to the centralized master store which applies them and then broadcasts them to all clones. Master stores get to choose what type of storage backend to use. E.g. In-memory versus SQLite for persistence. Data stores also support expiration on a per-key basis using an amount of time relative to the entry’s last modification time. # Lookup a value in the store based on an arbitrary key string. # End after we iterated over looking up each key in the store twice. # look up each one's value. # a native Bro type, namely 'set[string]'. # likely want to use this method of inspecting the store's keys. # All data store queries must specify a timeout. # it hasn't had time to get fully set up yet. Note that all data store queries must be made within Bro’s asynchronous when statements and must specify a timeout block. This section contains a few brief examples of how various communication patterns one might use when developing Bro scripts that are to operate in the context of a cluster. For simplicity, the following examples do not use any modules/namespaces. If you choose to use them within your own code, it’s important to remember that the event and schedule dispatching statements should always use the fully-qualified event name. Note that other identifiers in Bro do not have this inconsistency related to module namespacing, it’s just events that require explicitness. This is fairly straightforward, we just need a topic name which we know all workers are subscribed combined with the event we want to send them. # example of how you can further discriminate based on node identity. # Can check based on the name of the node. # Can check based on the type of the node. # eliminated by using the following conditional directives. # any code within is just ignored / treated as not existing at all. This should look almost identical to the previous case of sending an event from the manager to workers, except it simply changes the topic name to one which the manager is subscribed. # choose to relay the event across it. # which node is up next in the round-robin. If you want to offload some data/work from a worker to your proxies, we can make use of a Highest Random Weight (HRW) hashing distribution strategy to uniformly map an arbitrary key space across all available proxies. © Copyright 2019, The Zeek Project Revision ef39a55e.